Another clear morning and another breakfast at Nellies, as per yesterday. Well, why change a good thing? After a leisurely bag packing session to allow the rush hour traffic to calm down, we checked out and dug the car out of the bowels of the hotel and set off for Banff, about 125km away. Getting out of Calgary was a doddle. It’s easy to follow the SatNav, sorry GPS as it’s called here, when you have a) an idea how to work it and b) an idea where you’re actually going. Your author at the conference looking cheerful wearing a freebie fedora from RedHat. So today, the reason my job is paying for me to be here began. There’s not a deal you can say about the conference – one line summary is, I went, it was OK. Most of this year’s conference, the ‘theme’ if you like, is about a technology known as containerization, which is something we don’t do at all as yet. I find it quite interesting, brilliant even, but I struggle to figure out how we might deploy it in our current setup. I did manage to score a free mini-tankard from the HP stand in the dinner break though! Down in the breakfast area this morning there were suspiciously more men in the 30-50 age bracket than there had been all weekend. Sure enough it wasn’t long before I spotted a LinuxCon Dublin tee shirt from last year, so it looks like my ‘business’ crowd are all arriving, with many of them choosing the Ibis hotel instead of the super expensive conference one. I had no idea what plans some of them may have had, but I knew what I was hoping to be doing. I started my travels today by riding out to the Berlin Wall memorial, which is the longest bit of surviving wall. Getting slightly cocky with the transport system now, I took the U1 from in front of the hotel, swapped to the U6 heading north at Halleschers Tor, then off at Naturkundemuseum for the start of a 10 minute walk to the wall. I then messed this up by walking entirely the wrong way from the U-bahn for 5 minutes, which is about the time it take google maps to re-orient itself when exiting from underground. It has been a funny day today, I think mostly because I’ve felt a bit off colour like I am starting with a cold or something. I didn’t feel ill, just not right and very, very tired. The weather didn’t help by being that persistent sort of spitting rain, on and off all day, and you’re never quite sure whether to have your brolly up or down. The tiredness wasn’t due to lack of sleep ‘cos the bed was very, very comfy. Breakfast was included in the room rate and was the usual continental mixture of rolls and cheese and cold meats and stuff like that (and yes, there was Nutella). I do like flying from Doncaster-Sheffield Robin Hood Airport at Finningley; it’s small, human and efficient in a way that is totally belied by its polysyllabic name. That morning I had left my home in Sheffield at the scary hour of 4.30am, but somehow ended up airside in the departure lounge sat eating a bacon butty at 5.30am and wondering what I was going to do with the all spare time until the flight. In that first hour I’d managed to drive the 30-odd miles to the airport, park, walk to the terminal, check in a suitcase, clear both immigration and security and order, pay for and receive said bacon butty. Not a bad start to the trip. 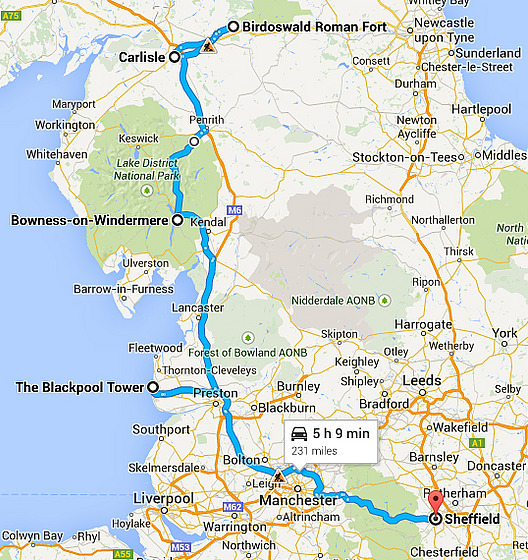 The Route for Day 5. 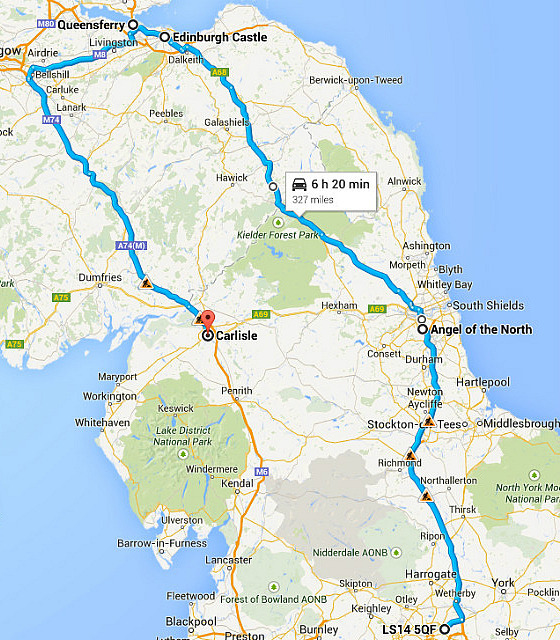 The Route for Day 4. The Britannia Leeds Hotel is our first ‘chain’ hotel and the first hotel that is close to our £50/night budget. It seems to be pitched primarily as an overnight stop for coach passengers, (there are three in the car park), and is clean and basic if a little jaded. Although we tried to take the room + breakfast deal when we checked in, it seems that the night man didn’t manage that and we’re not on the list, requiring a quick trip back to reception and some cash in exchange for a voucher. During breakfast Stu takes exception to Eamon Holmes’ interviewing technique on Sky News and tweets a mildly derogatory comment. This gets picked up and refuted by one of Eamon/Sky’s minions and Stu is quickly embroiled in a multi-person twitter flamefest, which we find highly amusing.